I haven't painted any birds for several months and I do enjoy painting them. This week I was prompted to do so and this is my latest attempt for the Facebook page `Paint Colorful Birds For Fun'. This was done using a guide photo on my ipad. The attraction was twofold, movement and great colours. The blues used were Phalo Blue (Maimeri PB15-3 Green Shade), Ultramarine Blue (PB29), Cobalt Teal Blue (Daniel Smith PG50 ) and Cerulean (Daler Rowney PB36). The red was a mixture of Quinacridone Coral (Daniel Smith PR209), Quinacridone Rose (Graham PV19) and a touch of Permanent Carmine (W& N PR N/A). The surrounding colours comprised mixtures of Phalo Green (Maimeri PG7),. Apatite Green (Daniel Smith), Translucent Brown (Schminke PBr41) plus some Raw Umber and Burnt Umber. I think that's it. I first made a loose pencil drawing using a Pentel 07 2B mechanical pencil, then painted the head moving outwards. The surrounding area was painted simultaneously rather than afterwards. After it was all fully dry I added a few small marks to define things a little better. I did put a small amount of masking fluid (Pebeo) on the head area. I did splash the paint in the surrounding area to avoid too tight a result. I only used two brushes, the Isabey retractable No.6 and a Rosemary No 6 retractable Kolinsky. The Isabey, while called a 6 is actually very slim and considerably smaller than the Rosemary 6 but good for detail. Overall I was quite pleased with the result. Having a collection of about 100 art books I'm not inclined to buy any more, especially as bookshelf space is at a premium. However I am easily tempted and having bought many off Amazon in the past I constantly receive e-mails from them prompting me (they hope!) to buy more. This modest little book was one such they recommended and as it was inexpensive I decided to take the plunge. One reason for doing so was that I, up to now, have based my colour choices on those of Charles Reid which basically are skin combinations of Cadmium Red Light, Yellow Ochre or Raw Sienna plus Cerulean. He does use other colours when painting people of different ethnicity but these are the main ones. As well as Charles Reid I greatly admire the work of several other artists who paint portraits in watercolour, Lin Fealing, Stephie Butler, Stan Miller, Janet Rogers. Ted Nuttall and some of the Asian artists. And there are many others. The thing is they often use different colour combinations and I wondered if I ought to experiment a little more, especially as I regard my portrait painting still very much a work in progress. It may always remain so. This isn't just about watercolour as other mediums feature but the basic principals relate to all. The author is William F.Powell who is described as `an internationally recognized artist and one of America's foremost colourists'. The book is composed of profusely illustrated descriptive pages, all similar in layout to those above. I haven't actually used it much - yet - but I think it could be very useful. Is it worth buying? Certainly if you are into portraits or even figures it could be very helpful and at the price - second hand copies are even cheaper - is a steal. This was the subject at the most recent AVA session. It is a fairly popular subject but even so only 15 or so members were present. An interesting subject enjoyed by all those present. Next week it is `Action'. The artist quality range shown above comprises 72 colours of which 52 are single pigment paints. There is also a second range - I hesitate to call them student quality - called Venezia with 36 colours. Maimeri were one of the first paints I bought and the reason was good quality combined with an excellent price. I discovered a small discount art materials company called if I recall right `Framework Art & Craft'. They are on the Cheney Industrial Estate in Swindon in one of the units. I believe they still are but unfortunately discontinued Maimeri due to poor sales - they said -so I've not been there for some years. 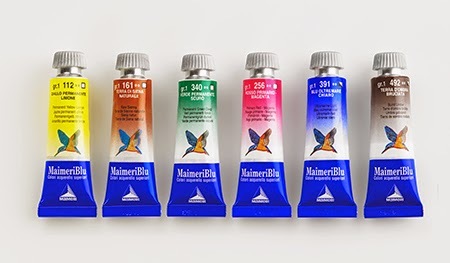 "In most cases the color appearance, pigment quality, lightfastness and handling characteristics rival the watercolors from Daniel Smith, M Graham or Winsor & Newton".....Overall, Maimeri Blu paints are bright, sweet and beautifully formulated...."
Not a bad endorsement although he does have a few quibbles and I have one myself. Bruce says the Cobalt Violet is mislabelled and certainly Golden Lake has been for years. I've never had Cobalt Violet but the Golden Lake was supposedly Quinacridone Gold. However the label said PV49 which is obviously wrong and according to Bruce the pigment is now PY42 `a similar pigment' according to Maimeri, as the only current source of PO49 is Daniel Smith. I contacted Maimeri querying this but received no reply - typical of many companies that don't like awkward questions. Handprint however has or had considerable clout and he received an e-mail from them with the above information. Incidentally I didn't like the original Golden Lake, not nearly as good as the Winsor & Newton single pigment PO49, now unfortunately a three pigment mix. Apart from Golden Lake I am happy with most of the Maimeri paints I have with Avignon Orange (PR206) a particular favourite. I also tried a few Venezia paints and found them pretty similar to the main range But don't buy the `Flesh Colour' - horrible. If you check them out many of the colours have the same name and pigment. Unfortunately Venezia is not readily found in the UK. We now come to the question of pricing and availability. In North America all the main discount specialists seem to sell them often including Venezia and at excellent prices. I do have a problem with the way Maimeri price the paints. They operate four series and series 1 and 2 are quite competitive. 58 of the 72 colours are either series 1 or 2, the majority series 1. The problem arises with those that are series 3 and 4. Why for example is Rose Lake, the red form of PV19, in series 3 when Primary Magenta, the rose form of PV19 is in series 1? The Cobalts, Cadmiums and Cerulean are in series 4, a hefty £15.20p in Jacksons latest catalogue. Winsor & Newtons Cerulean, albeit 14ml as opposed to 15ml, is shown as £12.85p. No contest buy W & N and this applies to the Cobalts and Cadmiums. You really have to look at the pricing in the various makes and compare pigments - not names - to see where the best buys are.